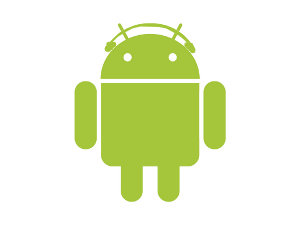 Listening to tunes on your Android device is serious business - no doubt about it. It's so serious that many of us are pretty well set in our ways for what we consider the "choice" Android music-listening application, and we aren't willing to budge on it. PowerAMP users, for example, swear by the application's seemingly endless list of customizations and options. On the other hand, Subsonic devotees like myself are advocates of what is probably the most configurable music streaming experience in existence. But the big boys have come to play, and with Google Music Beta entering the foray, along with Amazon's still-somewhat-new Cloud Player, the war for musical dominance on Android getting louder by the minute. But who reigns supreme? That's quite a few features to consider - and really, these apps are all a little different from one another in their music-acquisition philosophies, something that Artem felt made a comparison, in some respects, difficult. I disagree - aside from dedicated internet radio applications (ala Pandora, Grooveshark, etc), most of us probably just use one other music application. We've all probably chosen that application based on our individual needs, as well. For example, I chose Subsonic because I have a very large (>100GB) music collection, much of which is in high-fidelity 320Kbps MP3 format, meaning the amount of space each of my albums takes up can be rather ginormous. This makes storing any substantial amount of music on my phone locally a little difficult, but Subsonic allows me to cache the last 10GB of I've streamed so that it can still be played offline - rather convenient when you're trying to keep your data use down or have no signal. Also, I don't want to pay for 100GB of Amazon or (eventually) Google storage. But I also have a pretty decent internet connection at home - so that factors in as well. When it comes down to it, choosing a music app is all about what your needs are - so we're going to break down the strengths and weaknesses of the major players. You Should Use It If: You're a beta-invitee to Google Music, have a vendetta against Amazon, and Subsonic is too complex or impractical for you. Before I even delve into Google Music, be aware, I'm not a beta-invitee at this point, so I can't legitimately comment on the quality of the service's streaming, tagging, etc. Though I can say what I know about the Music application itself - it is about as bare-bones as you can get. But it does keep things simple - something Google is famous for doing well. Unfortunately, I don't think the Music application really is done all that well. The scrolling cover-art background is a nice touch, but when most of you albums don't have artwork, it starts to look more bland than exciting. Google's tagging recognition on tracks is generally good, and the various sort options lend an illusion of flexibility. In reality, they just take up space at the top of the screen. I think most of us are pretty content with hierarchical (artist -> album -> song) sorting. If I ever want the entire list of songs or albums on my phone, I'll let you know. Music has, essentially, no configuration options. 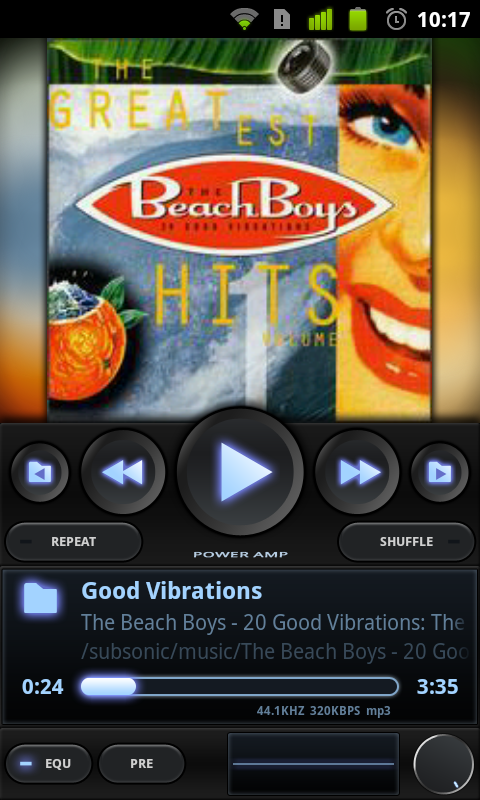 It doesn't have lockscreen music controls - something even Amazon Cloud Player can lay claim to. In combination with the actual Google Music locker service, Music becomes more robust, but only just enough to compete with Amazon's product, and even at that, it's hard to see how Google's service is any better. You Should Use It If: Subsonic is a little too technical for you (or you don't have an always-on desktop at home), you still want cloud-based music streaming, and you buy a substantial portion of your MP3's from Amazon. Amazon Cloud Player has burst onto the Android music scene seemingly out of left field. Unfortunately, its newcomer-status stills shows at this point - while it is very easy to set up, Cloud Player is a fickle application with limited configuration options. Though it does support the basics (a "Now Playing" list, playlists, shuffle), the application itself is nothing to write home about. In fact, I've found that while streaming over Cloud Player, any significant interruption to your connection will simply cause the player to skip to the next track and start downloading it, instead. Talk about annoying. But, Amazon does offer you 20GB of cloud storage after one album purchase from Amazon's MP3 store, and any purchases made therein don't count against your storage limit - quite the incentive to buy yet more stuff from the US's favorite digital retailer. The Cloud Player upload utility isn't terrible, either, but it's by no means great. Cloud Player also scans your device for locally stored tunes, so you aren't limited to your Cloud library. Frustratingly, you can't simply download single tracks for playback or storage, unless you want to add them one-by-one to a playlist or the now playing queue with a long press action. This is part of the reason I stick with Subsonic - I can pick and choose the tracks I want to download or play with checkboxes, and that's not exactly revolutionary technology. You Should Use It If: You use Winamp on your home computer, internet radio stations are something you enjoy, and you want to spend approximately zero dollars. Winamp is hands-down the easiest among the top three music players to get up and running, particularly if you've used Winamp for Windows before (for the syncing side of things, that is). It's also the only app on the list that straddles the fence between streaming and pure local playback, via its Wi-Fi Sync utility. Winamp won't download tracks from your home computer's library unless it's connected via Wi-Fi and the library is visible on your network - something a lot of people may not be comfortable with. Still, Winamp offers a lot of options (like a built-in list of internet radio stations, and free sponsored music downloads) for a free piece of software (it's the only truly free service of the five), and it looks good doing it. But Winamp is, at heart, a local media player with a few tenuous connections to the net. You Should Use It If: You have a dedicated, always-on desktop computer at home with a robust net connection, a large music collection, and some patience to set everything up. Subsonic is a great, great piece of software. But it requires a significant amount of setup on the PC end, and it's not a true cloud service - it just uses your home computer or server to stream music to your phone. This does allow almost endless configurability of your streaming experience, which is really great if you're even a semi-power-user like me. Unfortunately, the Android application does leave some things to be desired in terms of a real music experience. Namely, Subsonic has none of the awesome volume, tone, and equalizer controls of PowerAMP (which is why you'll see PowerAMP occupying the #1 spot below), and it just doesn't look nearly as awesome. Subsonic holds its own - it has bitrate adjustment options right inside the app, it can support up to three individual Subsonic servers, and has cool menus for things like recently added or most played tracks. You can also adjust how many songs Subsonic will stream in advance, and how much SD storage it can take up as cache (you can even set it to unlimited). Subsonic is the bona-fide music geek streaming service, and I don't see myself switching any time soon. Also, be wary: the Subsonic server is free for a limited trial, but after that, you'll need to cough up $15 to register your server for mobile streaming. You do get a nifty Subsonic domain prefix, though, to make the process of connecting to your server a lot easier to remember. You Should Use It If: Streaming is either unimportant to you, or you don't mind downloading from the cloud via another app and playing in PowerAMP, and being able to truly customize your music listening experience is a crucial deciding factor for you. PowerAMP takes itself very seriously, and anyone who takes listening to music seriously can appreciate that. While PowerAMP definitely isn't easy to set up by the average-person standard (though for most of us reading here, it's probably very simple), it's significantly less work than Subsonic, and there's no doubt in my mind that it's a much better application overall. Of course, PowerAMP doesn't have any streaming or cloud access options, so you have to make do with local storage. Combined with any one of the above three streaming services, though, you can bridge the cloud "gap" with only a little extra work by simply downloading the tracks you want to listen to, and letting PowerAMP scan the directories they're located in. 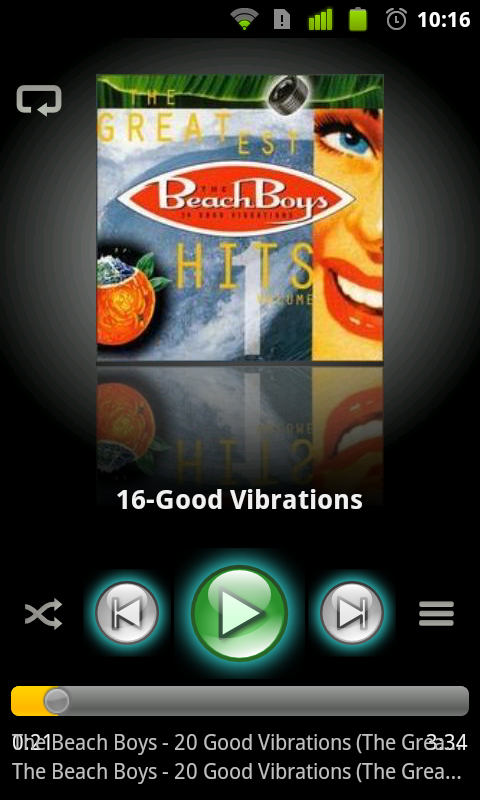 PowerAMP's equalizer and tone controls are fantastic. It's the only Android music player with gapless playback and crossfade options. It has more buttons than a 1960's stereo - and I love it. It really is the music lover's music app - and that's why it sits atop our list. And at $5, it may seem a bit steep, but you're getting more features and customization options than you can shake a stick at. I ordered these apps in what I considered a fair evaluation of their utility and general good-ness, but really, any of them may cater best to your specific needs. If you can't live without streaming, no amount of knobs and buttons will get you to switch to PowerAMP. Likewise, if you can't tear yourself from Winamp's radio stations and simple Wi-Fi sync, Subsonic might be a tough sell. What's your favorite music app on Android? Still convinced subscription and radio services like Pandora, Grooveshark, and Spotify reign supreme? Let us know in the comments.